Meteors, when you see them at the right time in the night sky, are a sight to behold, but when the same meteor contains a little bit of ice, then the beautiful night light show can turn into devastating nightmare, often leaving behind a horrific legacy of terror and destruction. Something similar had happened last night over the skies of Great Britain. 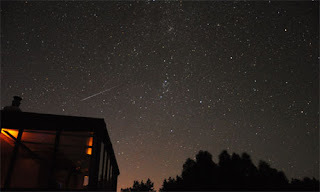 An extraterrestrial meteoric explosion occurred over the South Wales in Southwest GB, rocking the windows and setting off car alarms in a sonic boom effect. One of the eyewitnesses told us that the meteor, before detonation, had a heat trail behind it - a mixture of orange and white colors and was also very bright. This person also said that the meteor seemed very close to the ground. There are a dozen reasons why meteors explode: Some contain either ice or carbon dioxide trapped inside them. As the meteors enters the earth's atmosphere, the friction working on the meteor heat it up to very high levels (in the range of 3000 degree Celsius), the gases inside the ice start boiling and expanding, causing the meteor to burst in an epic display - with as much force as a hydrogen bomb.